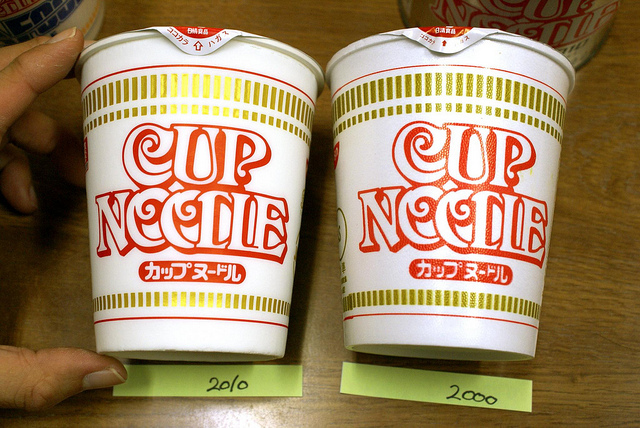 Cup Noodles are sold and loved worldwide. And this product is one of the 20th century’s most significant Japanese inventions (^o^)v. On September 17, Yokohama will host the grand opening of the Nissin Cup Noodles Museum directed by a famous designer, Kashiwa Sato. Today, I would like to take you on a quick virtual tour! Beginning with “Chicken Ramen” (the origin of instant ramen created only about half century ago), you can trace the whole history of instant ramen with a dazzling array of packages. In this room, you can see a computer graphic animated film telling about the “creative thinking”mind of Momofuku Ando, founder of Nissin. You can experience the creation of Chicken Ramen and witness the real manufacturing method. (reservation and entrance fee necessary). In this interactive noodle factory simulation, children (over 3 year old / under elementary school) assume the role of “noodles” themselves and become part of the manufacturing processes in a truly kinesthetic experience. There are more and more attractions. To me, Cup Noodles Park sounds quite fun! I wish I were a child XD! Eat in Trailer SUSHI Restaurant – Never Seen Before! ?